Last week, my husband was out of town. As a result of his absence, I adopted the ‘eat whatever the heck we want for dinner’ rule. I just hate going through a lot of work for a big dinner when it is just me and the kids eating! One night, I decided we were doing breakfast for dinner and out of sheer laziness I grabbed for the box of premade pancake mix in the pantry. Only to find it almost completely empty. Great. Now I need to find a pancake recipe that is quick and easy. I also wanted to find one that added in fruit and nuts to alleviate my guilt over feeding them pancakes for dinner. I whipped up a pancake recipe in just minutes that was creative and tasty! 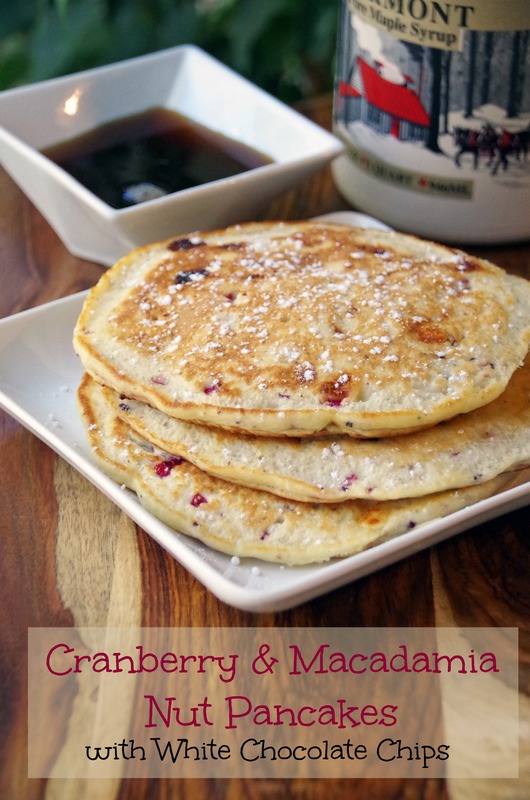 This easy pancake recipe has cranberries, macadamia nuts, and white chocolate chips and the kids were thrilled with our breakfast for dinner night! Delicious and easy pancake recipe loaded with extras! Put cranberry/nut mixture and white chocolate chips into the pancake batter and fold in gently. Let batter sit for 20 minutes. Stir gently again. Flip pancake and continue cooking until done. Top with powdered sugar and/or maple syrup as desired. Those pancakes look delicious! And yes, I adopt the same dinner philosophy when my husband is out of town! Thanks! I get a lot fewer complaints about dinner when I serve breakfast! These look terrific! I have to try them. One question, what if I used whipping cream instead of low fat milk? Good idea...bad idea? I'm no chef, so if you don't think it would work just say so. I think they'd be a big hit with the grand kids. Thanks. They might be a bit denser but not too sure. Much higher in fat but might still work! I would use regular milk if possible but no harm in giving it a shot!